When looking at the state of digital media and learning today, virtual reality (VR) is barely a blip in many of the broader conversations. Much of the work being done focuses on peer-to-peer learning and practices of social pedagogy, which are in many ways, the opposite of the current state of VR. About 20 years ago, VR in education had something of a research heyday. A search on Google scholar turns up thousands of results between 1991-1999. While the research never slowed, the technology never became accessible enough for virtual reality to become mainstream.That is changing now. For the past few years, the tide of VR has resurfaced with projects such as Google Cardboard, the kickstarter funded, now Facebook owned Occulus Rift, Microsoft Hololens, HTC Vive and the Samsung Gear, to name a few amongst the many either in or on their way to market. I attended the first Versions conference on the current state of Virtual reality. It brought together industry people from Google, filmmakers, venture capitalists, academics and artists to tell about the future of virtual reality. Education was not mentioned. Despite its invisibility in the conversation, VR is in the process of slowly creeping into educational institutions and is being imagined as the future of online schools. Google has its own pilot program for cardboard called Expeditions that allows students to go on virtual field trips right at their desks. As this is the first time VR has potential wide reach given the lower cost headsets such as Google Cardboard, I am a bit nervous about it being taken up in educational settings uncritically. Put on the goggles and carefully edited information comes at the viewer. Early research, as laid out in the recently published Code of Ethics, seems to hint that the brain can attach to the virtual avatar as though it were its actual body when it mirrors the physical body in a way that is not possible in non-immersive avatar-driven environments. It risks being the worst case scenario of the Frierien banking system of education, immersive with no outside, coming from an unknown or unseen source, moving the viewer through space as if it were real without time or space for critical reflection. This is, I believe right, a direct result of imagining VR as an extension of film rather than the digitization of the interactive performance/art installation that depends on the position, interactions, and sensations of the body and agency of the individual to make sense of the world. At Versions, the term “Dramatic Compression” surfaced and I wonder if that might be where we start with education. In terms of historical travel, or traveling distance, if more interactivity and social features are built in, it could be amazing, or given the immersive nature, traumatic. An immersive Oregan Trail, given how often the people in my Wagon had dysentery, might be too much. There are three apps that I think show some of the potential of VR as an interactive space. GermBuster VR, an app by Realiteer, a project that makes a freely printable handset that augments the virtual reality experience. In the game, the player cleans a room with a bubble gun that is controlled by moving the printed handset around. Virtual Kaiju 3D is one of the few VR experiences that I’ve had thus far that creates an experience for both the person in the headset and those outside by using voice as a control for what is happening on the screen (so those viewing the experiencer see someone roaring and spinning with goggles on). VRSE: Waves of Grace, “is the story of Decontee Davis, an Ebola survivor who uses her immunity to care for orphaned children in her village.” This one can also be viewed through a web browser. Seeing it in virtual reality, it brings up another critique that, as VR is used more and more as a tool to disseminate information through things like the New York Times VR app or through UN projects, something Waves of Grace is part of, needs to be taken into consideration. VR is an empathy machine. As Virtual Reality moves from being a dream of the future to a consumer reality, it is important to have critical thought around what is being gained and what is being lost. It is also important to weigh the potential for long-term unanticipated psychological risk that might come from using these systems. I am not sure at this time what great educational content for virtual reality will look like at the various levels and institutions of education. I am eager to explore, though, keeping in mind there is always a risk in adopting new technologies into learning spaces. 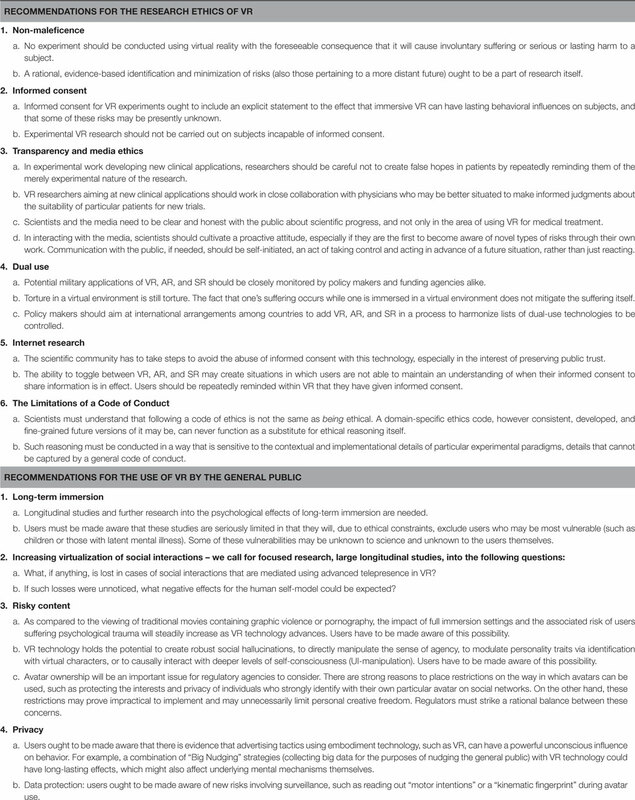 The code of ethics linked before has a wonderful list of Guidelines for VR that are worth considering. deep thinking about what the best role for VR in education is. Historically, when thinking of the types of media that have been world changing in the past created more places to connect with others. They created a shared culture. VR as it is imagined right now seems to lean toward being as escapist as possible. The viewer teleports to another world without their body leaving its static location. I am still at a point where I worry VR takes the student at the center too far by eliminating their ability to interact with the world right next to them. That being said, all of this is conjecture. VR as a mass market product is still emerging. I am enjoying following the conversation and playing with the headsets that use my smartphone as a screen. Despite the risks and worries, I am still excited to see how VR evolves and what educational experience might be designed for it.